Alfonso Cuarón's Venice Golden Lion winner ROMA is an exquisitely crafted, heartfelt love letter to the people and places that populated his youth. 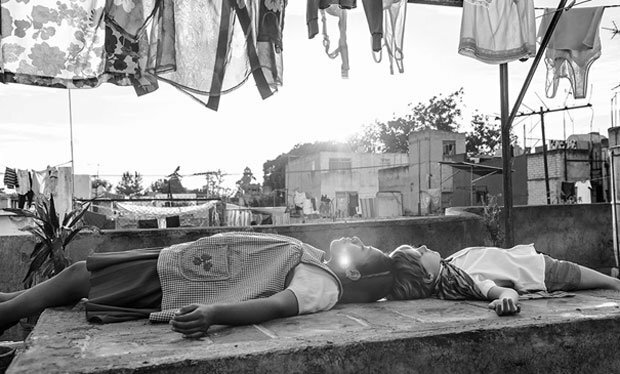 Shot on 65mm in black and white, it has an epic grandeur matched with a quiet intimacy that draws the viewer into the life of a middle-class family and their loyal servant Cleo (Yalitza Aparicio). Set in the Roma district of Mexico City over 1970 and 1971, it draws the viewer into the domestic upheavals of Cleo, her employer Sofía (Marina de Tavira) and a brood of boisterous young children, whilst also acknowledging tumultuous times in the life of the country. A shopping trip stumbles into the heart of the Corpus Christi massacre, an earthquake strikes in a hospital neonatal unit, forest fires erupt during a New Year's celebration. There is the sense of a clear and present danger all around. Clinging to each other may be the only way to survive. Cuarón's narrative unfolds as a cinematic scrapbook of memories, concentrating on the squabbles between bickering children, trips to the cinema to see Marooned and La Grande Vadrouille and the prolonged absence of a father who is said to be in Canada at a conference. Cleo discovers that she is pregnant by a man with no sense of loyalty to her and Sofía is as supportive and caring as she can be. Cleo may spend days in cooking, cleaning and babysitting and meet every whim of the family but she is almost one of them. Thoroughly absorbing and gently touching, ROMA opens a window into the past and has the feel of an Italian neorealist classic. In Cuarón's melancholy reflections on lost times, the men cause all the trouble and the women endure, nurture and accept the necessity of keeping calm and carrying on. Screening as part of the Toronto International Film Festival 2018. Available on Netflix and on general release from Fri 14 Dec.
Cleo (Aparicio) is the loyal servant of a middle-class family headed by Sofia (de Tavira), in the Roma district of Mexico City in 1970-71. Beautifully crafted family drama that mixes quiet intimacy with observation of the tumultuous times in the nation, melancholy but thoroughly absorbing and gently touching.